Want to reinstall Windows 7 to fresh state or want to perform clean install of Windows 7 on your computer or virtual machine (VM), but couldn’t find any DVD or USB installation media, nor ISO files? If you have purchased a Windows 7 license, in addition to product key, you usually have access to either an physical installation media in DVD discs, or able to download Windows 7 ISO images via digital delivery channel. If the Windows 7 setup installation ISO files are missing or deleted, you could no longer able to install Windows 7. Originally Microsoft did not provided ability to download Windows 7 OS in any format, unless you purchased the retail version of Windows 7 license online. In such cases, Microsoft delivered the ISO downloads via Digital River, Microsoft’s official content delivery partner for Windows 7. Though the direct download links for Windows 7 ISO images work for those who not purchased the license online, it’s not an officially sanctioned nor legal way. In fact, Microsoft have removed the Windows 7 ISO files from the Digital River’s servers since 2014. You need a genuine and valid retail Windows 7 product key to download from Microsoft Software Recovery site, regardless of editions. 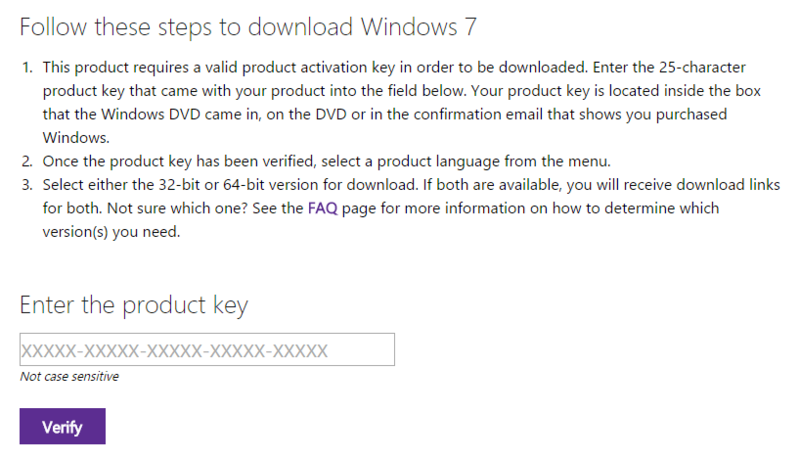 It does not accept OEM Windows 7 product key (product key that printed on label pasted on purchased PC), upgrade version product key, product key from MSDN / TechNet, or Enterprise edition key. The product key you entered appears to be for software that was pre-installed on a device. Please contact the device manufacturer for software recovery options. Visit Windows 7 Disc Images (ISO Files) download page at https://www.microsoft.com/software-download/windows7. If you purchased your copy of Windows through school, university or other academic institution, visit https://www.microsoft.com/software-download/vlacademicISO instead. Locate the Windows 7 product key – the product key is located inside the box that the Windows DVD came in, on the DVD, on the receipt or confirmation page for a digital purchase or in a confirmation e-mail that shows you purchased Windows. If you purchased a digital copy from Microsoft Store, you can locate your product key in your Account under Digital Content. If you no longer able to locate the product key, but have the Windows system still up and running, you can easily retrieve the product key from the system. Enter the product key in the text box at the bottom of the page, and hit Verify button. Select either the 32-bit or 64-bit version of Windows 7 （if both are available, both download links are given) for download. You can also send the Windows 7 setup ISO download link to email. The download link, which expires after 24 hours, can be used to download the Windows 7 installation ISO at later time. Burn the ISO image to DVD or write to USB flash drive to create bootable USB drives and DVDs. Ability to burn ISO to DVD is built-in in Windows 8, Windows 8.1 and Windows 10. In Windows 7, or to create a bootable Windows 7 setup USB flash drive, you may need Windows USB/DVD Download Tool or other third party software. You can download official Windows 7 (RTM & SP1), Windows 8.1 and Windows 10 ISO files via Microsoft Tech Bench Upgrade Program. Don’t have a Windows 7 retail product key? Now all Windows 7 users are entitled to free upgrade to Windows 10. Download Windows 10, and the Windows 7 product key can be used to install and activate Windows 10.